The streets of Cluj-Napoca, Romania, were crowded shoulder-to-shoulder, and 15-year-old Marius Sabou couldn’t get where he was going. He was hemmed in by the mass of people. Christians were mocked and ridiculed. Their every move was watched. Despite this anti-Christian sentiment, something amazing happened. Evangelist Billy Graham, after years of prayer and negotiation, broke through the infamous Iron Curtain and was allowed to preach in the country—not out in the open, but in churches and cathedrals (which naturally limited the number of people who could hear the message). From Sept. 8-15, he traveled across seven different cities. >> Read how Cluj-Napoca is preparing for Billy Graham’s grandson, Will Graham, to preach there this weekend. It was the famous evangelist’s visit that brought Marius to the city, but he would not be able to see Billy Graham. The church was already full. Young Marius was one of those on the street amid tens of thousands of spiritually hungry Romanians who hoped for a glimpse of the visiting religious leader. And he found himself faced with an unplanned dilemma. “I was not able to hear the message, but there was a song and all of these people started to sing. Near me was someone who started to laugh when he heard all these people singing,” said Marius. Three decades ago, Romanians filled churches and streets hours before Billy Graham was scheduled to speak. Loudspeakers were often put on poles and in treetops for those who couldn’t get into the venues. While advertising for Mr. Graham’s visits to Communist countries was often prohibited, news traveled fast by word of mouth. 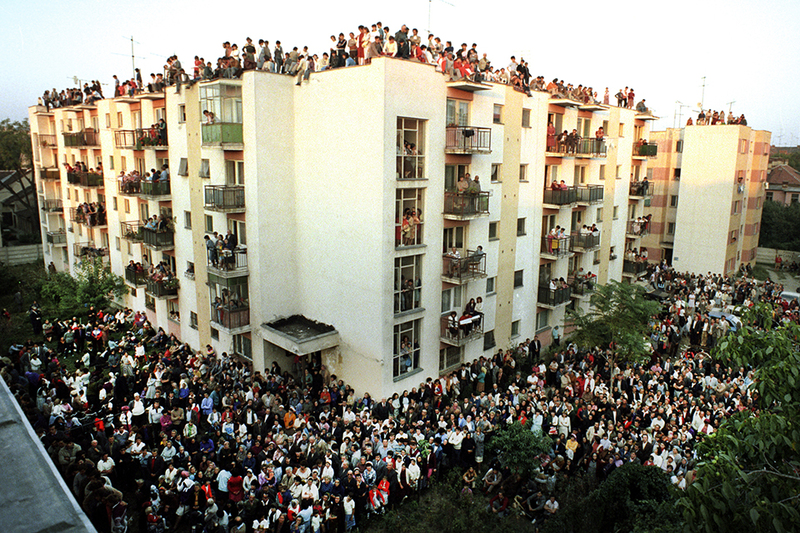 In Arad, Romania, people hung out on an apartment rooftop to hear the Southern preacher. Having been raised a Baptist and having professed Christ, he was well accustomed to being mocked for his faith and labeled as “different.” But this was a defining moment for him. Would he follow his faith and join other believers in singing, or side with the world? Much has changed in Romania over the last three decades. Communism—and Ceau?escu’s brutal administration—fell in the bloody revolution of 1989. The country now has a democratically elected government, and Christians have the opportunity to worship freely. Some things don’t change, however. People still want to know that they have purpose in life. They want to be loved. They want to have hope, in this world and for eternity. These longings are what drew people by the hundreds of thousands to Romania’s streets for Billy Graham’s visit. Organizers of this weekend’s Celebration of Hope in Cluj-Napoca hope and pray that many more will find that hope in the coming days. Marius is now a father and a pastor of a fast-growing church in the city. Understanding the importance of evangelism and discipleship, he also agreed to be the local leader of the Celebration effort. It hasn’t always been easy. As in the United States and other places around the world, pastors have full schedules, and getting them to agree to add something else to their lists can be difficult. So Marius issued a challenge. He asked them to take a step of faith. In fact, “The Step of Faith” has become the slogan—the rallying cry—of the Celebration of Hope. Everywhere Marius has gone, he has challenged pastors and local Christians to take the step: to pray, to look for someone in spiritual need (“You’ll see that the Lord will open the door,” Marius assured), to meet the needs of the person, and to share the Gospel. Time and time again, Marius heard stories of lives and eternities that were changed through this simple challenge, and quickly churches began to see the importance of the Celebration of Hope and sharing Christ with others. “Evangelism is so important. I see evangelism as connected with discipleship. For me, the first part of discipleship is evangelism. It starts with evangelism, with the call,” said Marius. And much like Billy Graham’s tour in 1985, Marius believes his city will be impacted for years to come as God uses Will Graham’s visit to reach those who need the hope of Christ. “I think this will have a lasting effect over our churches, over our lives, and over our city,” said Marius. And he should know. He lived it 32 years ago. He’s seen it in the past several months. And he has faith that God will continue to move this weekend.